Matfer Bourgeat Exoglass Baking Pans and Molds are made of a composite material that is non-deformable. This mold will hold up in ovens at temperatures as high as 500 degrees Fahrenheit, and can also operate safely as low as -5 degrees. Its nonstick surface ensures that you can quickly and easily remove baked goods that are intact. You can clean this mold in your dishwasher. 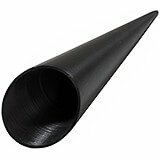 Exoglass® Cones. Made of single piece of composite material. Easy and quick removal from mold without risk due to zero heat inertia. Immediate cool down when removed from oven. Heat resistant from -5° to 500°F. Innovative. Super Heat Resistant. Non-Stick. Long Lasting. Dishwasher safe. Pack of 12. Measurements: 1 1/2" Diam. x 5 1/2" L. Weight: 4 oz. 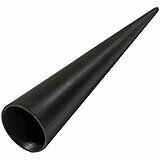 Exoglass® Cones. Made of single piece of composite material. Easy and quick removal from mold without risk due to zero heat inertia. Immediate cool down when removed from oven. Heat resistant from -5° to 500°F. Innovative. Super Heat Resistant. Non-Stick. Long Lasting. Dishwasher safe. Pack of 12. Measurements: 2" Diam. x 5 1/2" L. Weight: 6 oz. 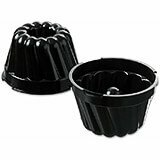 3.5" x 1.5" x 1.5"
Exoglass® cake molds made of composite material suitable for both savory and sweet creations. 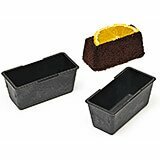 Use these mini cake pans by themselves or with the optional Matfer baking sheet 347060 (sold separately). Innovative. Super Heat Resistant. Non-Deformable. Non-Stick. Long Lasting. Dishwasher safe. Pack of 6. 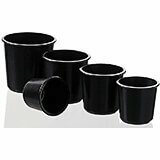 Measurements: 3 1/2" L x 1 1/2" W x 1 1/2" H.
Made of composite material suitable for both savory and sweet creations. Innovative. Super Heat Resistant. Non-Deformable. Non-Stick. Long Lasting From -5 to 500°F. Dishwasher safe. Pack of 12. Measurements: 4" Diam. x 3/4" H. Weight: 1 lb. Exoglass® Round Cake Mold, perfect to make Rum Baba. A baba cake it's a small rich sponge cake, typically soaked in rum-flavored syrup. Made of composite material suitable for both savory and sweet creations. Innovative. Super Heat Resistant. Non-Deformable. Non-Stick. Long Lasting. Pack of 6. Measurements: 1 1/4" Diam. x 1 1/4" H. Capacity: 2 oz. Exoglass® Round Cake Mold, perfect to make Rum Baba. A baba cake it's a small rich sponge cake, typically soaked in rum-flavored syrup. Made of composite material suitable for both savory and sweet creations. Innovative. Super Heat Resistant. Non-Deformable. Non-Stick. Long Lasting. Pack of 6. Measurements: 2" Diam. x 2" H. Capacity: 2 3/4 oz. Exoglass® Round Cake Mold, perfect to make Rum Baba. A baba cake it's a small rich sponge cake, typically soaked in rum-flavored syrup. Made of composite material suitable for both savory and sweet creations. Innovative. Super Heat Resistant. Non-Deformable. Non-Stick. Long Lasting. Pack of 6. Measurements: 2 1/3" Diam. x 2 1/3" H. Capacity: 3 1/3 oz. Exoglass® Round Cake Mold, perfect to make Rum Baba. A baba cake it's a small rich sponge cake, typically soaked in rum-flavored syrup. Made of composite material suitable for both savory and sweet creations. Innovative. Super Heat Resistant. Non-Deformable. Non-Stick. Long Lasting. Pack of 6. Measurements: 2 1/2" Diam. x 2 1/2" H. Capacity: 4 3/4 oz. 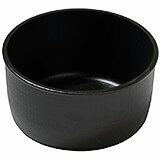 Exoglass® Round Small Cake Mold, perfect to make Rum Baba. A baba cake it's a small rich sponge cake, typically soaked in rum-flavored syrup. Made of composite material suitable for both savory and sweet creations. Innovative. Super Heat Resistant. Non-Deformable. Non-Stick. Long Lasting. Pack of 6. Measurements: 2 3/4" Diam. x 2 3/4" H. Capacity: 7 1/2 oz. 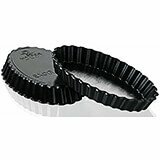 Exoglass® Fluted Round Tartlet Baking Mold. Made of composite material suitable for both savory and sweet creations. Innovative. Super Heat Resistant. Non-Deformable. Non-Stick. Long Lasting. Heat resistant from 5° to 500° F. Dishwasher safe. Pack of 12. Measurements: 3 1/2" Diam. 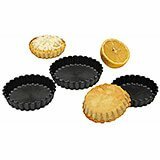 x 5/8" H.
Exoglass® Fluted Round Tartlet Baking Mold. Made of composite material suitable for both savory and sweet creations. Innovative. Super Heat Resistant. Non-Deformable. Non-Stick. Long Lasting. Heat resistant from 5° to 500° F. Dishwasher safe. Pack of 12. Measurements: 4" Diam. 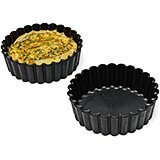 x 3/4" H.
Exoglass® Fluted Round Tartlet Baking Mold. Made of composite material suitable for both savory and sweet creations. Innovative. Super Heat Resistant. Non-Deformable. Non-Stick. Long Lasting. Heat resistant from 5° to 500° F. Dishwasher safe. Pack of 12. Measurements: 4 1/3" Diam. x 3/4" H.
Exoglass® Kugelhopf Mold. Made of composite material suitable for both savory and sweet creations. Top features: Innovative. Super Heat Resistant. Non-Deformable. Non-Stick. Long Lasting From -5 to 500° F. Dishwasher safe. Pack of 6. 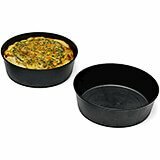 Measurements: 3 3/4" W x 2 1/2" H.
Made of composite material these pie pans are suitable for both savory and sweet creations. Fluted. Innovative. Super Heat Resistant. Non-Deformable. Non-Stick. Long Lasting. Heat resistant from 5° to 500° F. Dishwasher safe. Pack of 12. Measurements: 4" Diam. 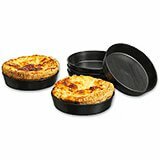 x 1 1/4" H.
Made of composite material these pie pans are suitable for both savory and sweet creations. Plain. Innovative. Super Heat Resistant. Non-Deformable. Non-Stick. Long Lasting. Heat resistant from 5° to 500° F. Dishwasher safe. Pack of 12. Measurements: 4" Diam. 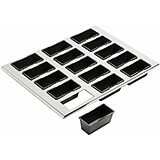 x 1 1/4" H.
Stainless steel tray holds 15 removable rectangular Exoglass® cake pans. Made of composite material suitable for both savory and sweet creations. Innovative. Super Heat Resistant. Non-Deformable. Non-Stick. Long Lasting. Set - Tray & (15) 3.5" x 1.5" x 1.5" removable molds. Dishwasher safe. Measurements: 12" Diam. x 15 3/4" W.
4.5" x 2.75" x 0.75"
Exoglass® Oblong Tartlet pan. Innovative. Super Heat Resistant. Non-Deformable. Non-Stick. Washable. Long Lasting. Heat resistant from 5° to 500° F. Dishwasher safe. Pack of 12. Measurements: 4 1/2" L x 2 3/4" W x 3/4" H. Weight: 1 lb. 1 oz.